Wherever the Anglo-Normans found soils to their taste, or a strategic point worth defending they erected an earthen mote, later replaced by a castle in places of special importance. 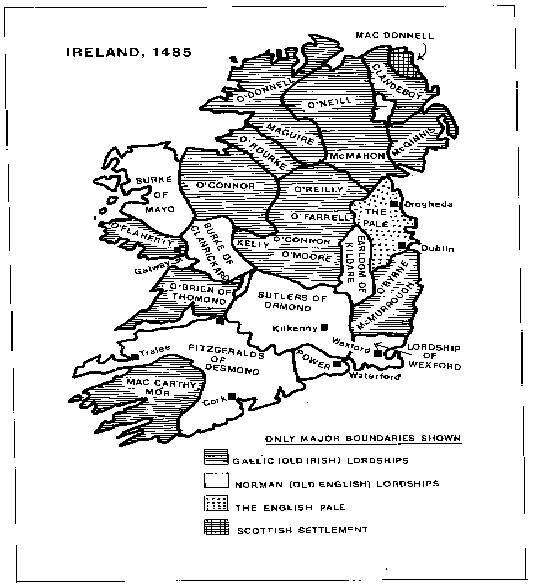 On the whole they did not advance beyond a line running from Skibereen through Galway to Cooleraine and settled most densely in in Leinster East Munster, which were to prove a centre from which Irish forces would frequently emerge to have the farms and towns of the surrounding town-lands. The basic Anglo-Norman unit was the manor, extending perhaps to 3,000 acres and here the lord would have his home-farm or stead, often protected by a moat, containing his house and his farm-buildings, with its surrounding fields. Other large farm units would be given to supporters, linked to the lord by allegiance as well as rent, to rent-paying individual farmers, and to borough communities and burgesses, with land in common, and their own court and other privileges. The holders of these larger units came from outside Ireland. The population explosion in Western Europe and in England at the time, had brought about men anxious for tenancies of good arable land in return for payment of money in services and in kind. They strove hard to ensure that the Gaelic Irish people would remain to herd cattle and till the soil, as they had been doing under their native chieftains. Now for the first time the Neolithic (systematic) type agriculture and estate management was put into practice. Monastic orders, such the Carmelites, Augustinians, Franciscans, built the local parish church nearby and large farm units were divided amongst supporters who were linked to the overlord through allegiance and through rent.